Wow where has the time gone? I can't believe it has been this long since my last post! A Lot has gone on in my life since then.. #1 event was becoming a dislocated worker after working for 16 years at Wilbert Plastic Services which closed July 16Th! So now not only I have become a national statistic, but I am a newbie at writing a resume and all of these apps are now done online... All new to me! 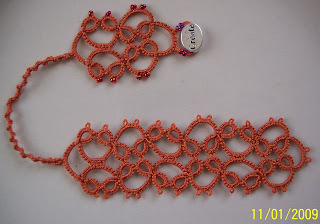 As for tatting though, the summer months are always fun filled with so many outdoor activities so not much time for tatting. These past 3 weeks I have tatted more than in the last 5 months. I demonstrated at our Conservation Center for their Heritage Days. This year it was extra special because my 7 yr old daughter came along with me and demonstrated "Finger Knitting". That was a big hit with the girls! We had girls lined up to try this out. Markeia had so much fun doing this. When being a demonstrator there, they ask for a donated item in your art for their fundraising charity auction. This year I shuttle tatted the 8 Point Bag, out of the "It's in the Bag" book. I tatted it in size 20 Lizbeth thread. A couple other projects I have been working on and just finished up this morning, was a couple of very special crosses. The story behind the cross pattern in it's self is a tear jerker. 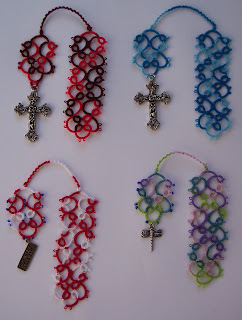 While tatting these crosses, it was a constant tug on my heart strings. The pattern is a Grandma Pearl original. Before her passing she was trying to finish one for all of her grandchildren and great grandchildren. She almost accomplished it. She had 2 in progress and one to start yet. Being it was her own pattern - she did not have it written down. So being that I was the one and only she taught to tat, my father-in-law asked me if I could complete her project and finish up what she had started. 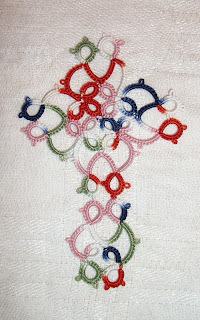 I sat down and looked at one of her completed crosses and wrote out the stitch count. I can't begin to describe the honor it was to hold her shuttle and work in my hands and continue on with her cross. After several hours of tatting and several tears shed, I finished up her project in time to pass out the crosses after her services. Now that was 9 years ago. 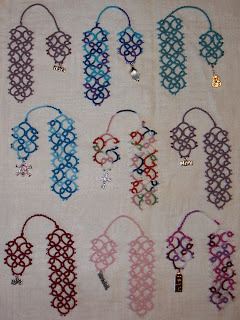 I feel that she wanted me to learn the art of tatting from her it was a sign of more. I still continue to past her beautiful gifts onto all the new great and also now great great grandchildren. I try to have a "Grandma Pearl Cross" ready for them as a baptism gift or shortly after.. So this morning I just finished up two crosses for a couple very special little girls. They are for my (step) granddaughters, which would be Grandma Pearl's Great Great Granddaughters. I tatted these with the love from the heart as Grandma Pearl would have also. :) So here they are... The 1st is for Kaylse, it was tatted in Lizbeth size 20 Mountain Breeze. The 2nd is for Ella, it was tatted in Autumn Spice (I love love love this color!) Lizbeth size 20. So I'm closing for now.. thanks for letting me share! My New-To-Me Book has arrived!! 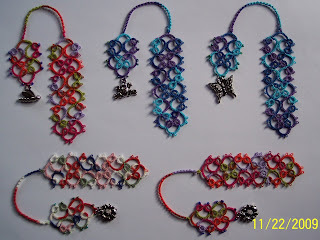 These are just so much fun to make.. Quick, easy and fun to customize for the person they are for.. 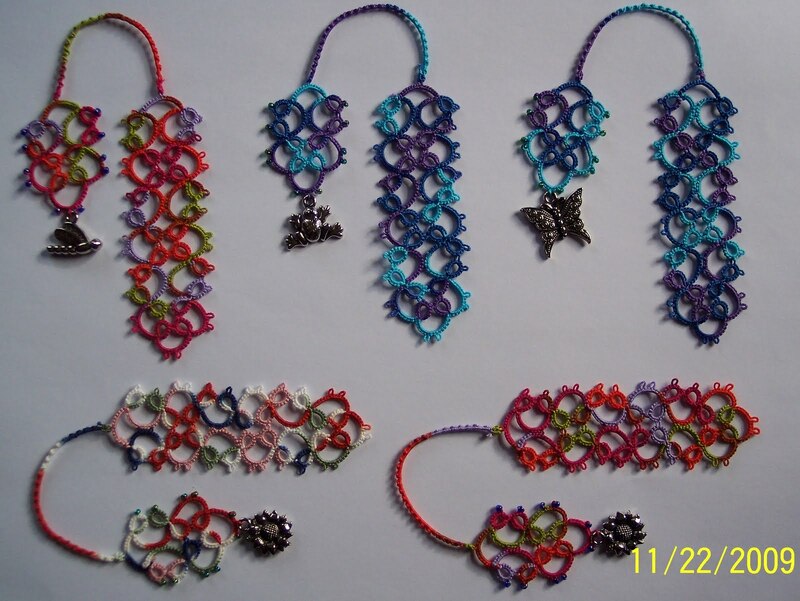 Here are the last 5 for my friend that wanted some for gifts.. All made in Lizbeth with the charms from Wal-Mart. I did find some different little charms at Micheal's while I was visiting my brother-in-law and his wife in Des Moines. I have 3 more in the works for gifts for my co-workers. I also started some snowflakes - tis the season! 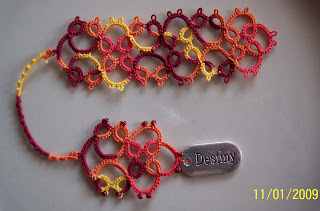 Happy Tatting!! Surprise Surprise... 4 more bookmarks.. :) Here are yet 4 more bookmarks.A friend of mine stopped by the other night and seen one of my bookmarks laying on my kitchen table. After talking about them, she asked me to make some for her family members for Christmas gifts... I was honored.. So I have a list of 8 for her to make, along with some I would like to give out as gifts too. Three of these are her's. All tatted in Lizbeth thread. Red Burst, Turquoise Twist, Spring Time and Angel's Love. The charms on these are from Wal-Mart and Hobby Lobby. I have started a pair of baby booties.. Will post a picture of them when completed.. Happy Tatting!! Hello Everyone, Here are two more of my new favorite pattern! :) One with lizbeth's "Falling Leaves" and the other is "Harvest Orange Med.". The Destiny charm is from Michael's, it came on a card with 6 different ones. The "Create" charm is also from Michael's (I believe). They are on a string like a lot of the beads come on.. The words "Hope" "Believe" and "Wish" also came on the same string. Another bookmark.. This one is tatted in Denim Whisper Lizbeth size 20. I have actually made 3 more but this is the only picture that turned out.. Will try to remember to take more of the other two before I give them away.. Also has anyone seen the new Lizbeth thread color "Fall Leaves"? It is amazing.. I will be loading the next shuttle with this.. look for a picture by the end of the weekend!! Happy Halloween! Happy Tatting!! I am happily married for 20 years to Mark. I am a mom to a 7 1/2 year old girl, Markeia. 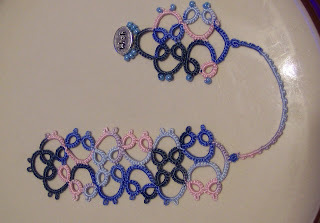 I have been shuttle tatting for 14 years. My husband's Grandmother Pearl taught me and I have been an addict ever since. ;-) I so miss tatting and chatting with her on the front porch on Sunday afternoons..